Okay, that’s just today, on another day I might opt for the kind of face which always looks as if you are smiling, even when you’re not. Or the ability to play amazing music like our church’s musical director today who filled a gap in proceedings at this morning’s service with an extempore interpretation of a well-known Easter hymn on the piano which sent shivers down my spine and caused my friend John and I to instinctively turn to exchange glances of shared wonderment and appreciation. Today, I choose strength, not mental strength, you understand, but sheer physical strength. Here’s why. Yesterday we were invited to a barbecue with The Neighbours. We always feel extremely privileged to be asked to join these regular gatherings of family and the closest of friends. It makes us feel, well, special. It was, indeed, perfect barbecue weather and Mr B and I had no other plans for Easter Saturday, having rather worn ourselves out the previous day, trying to keep up with the Trio of Rampaging Rascals. Thinking about it, I could have done with being Strong of Arm and Leg that day, too. Little wonder that I failed to win the potato and spoon race until Faris the Rascal stepped in to impede the progress of sister Tala so that I could slip through to the finish ahead of her. Anyway, back to the barbecue. My main concern was whether or not Mr B’s new, wider wheelchair would fit along the side passage leading to The Neighbours’ beautiful back garden. In consultation with our Hosts With The Mostest, it was decided to do a recce. But without Mr B on board, as this had tremendous Stress Potential should the wheelchair be too wide for easy passage. I did have Plan B which was to bring out of hiding an old, narrower wheelchair stored in the garage which we could use if pushed. No, I mean if we were pushed, not the wheelchair - though thinking about it, that also makes perfect sense. Only I knew Mr B wouldn’t be so comfortable as he would be in the new wheelchair and, unlike me, he wouldn’t be able to hop from one garden chair to another to ensure I could catch up on all the news from the other guests. Actually, to say I would hop from chair to chair is going a little far, especially as I would be presented, on arrival, with possibly the largest glass of sparkling white wine you have ever seen. Either my doubtful reputation is going before me or The Neighbours also thought I needed strength. In the end, our recce proved that there would be absolutely no problem wheeling Mr B and his new, wider wheelchair into the garden, with just a millimetre to spare when negotiating past the drain. So when four o’clock arrived, there were neighbour Matt and friend Gavin on the doorstep, ready, willing and able to Do The Necessary. Problem solved - and a splendidly sociable afternoon to look forward to, with the best of company, delicious food and beautiful surroundings. Tomorrow we are setting off on a short break to a Holiday Centre where I am assured all Mr B’s needs will be met in full, including willing volunteers on hand to push him in his wheelchair wherever he wants to go. It promises to be incredibly liberating for both of us as well as being the first holiday we have had together for more than six years. I am reliably informed that we will be able to Wheel And Wander through the gardens and down to the waterfront, where we can watch the ships sailing in and out of Southampton. It will remind us, I tell Mr B, of that long ago holiday in Tenerife when we sat on our hotel balcony for hours with a G & T, watching the Fred Olsen boats come and go. It’s just a few days but I am sure I will return feeling less tired, more relaxed and even - quite possibly - stronger. It won’t do much for my face or my ability to play the piano - but you can’t have everything, you know. The Trio of Rampaging Rascals arrived yesterday, firing on all cylinders. And that was before the Easter Chocolate Fix. I had been agonising about the optimum time to hide their Easter eggs so that they would not be a Molten Mess when the Trio finally uncovered them. It is true I didn’t estimate the Rascals would take too long to follow the Easter Trail I had set - but the sun was very, very hot and there wasn’t too much shade in our south-facing back garden. The Youngest of the Darling Daughters, travelling down with her sister and the Trio (she is just like me, can’t bear to miss out on anything) messaged to say that, if necessary, we could make the Trail the very first activity on our Splendid Afternoon of Easter Related Silliness. In previous years my Easter Trails for the Trio have been marked out with colourful mega blocks but this year I reckoned we should move on to a Woodland Trail of the type much beloved of my Brownie Guides in the days when I was a Brown Owl (known by the Brownies’ dads as “Brown Ale” for completely inexplicable reasons.) I thought it might be a step too far to introduce the Rascals to the full menu of woodland trail signs, so I decided to stick to arrows, just for this year. Next year I may introduce other signs, incorporating stones as well as sticks and finding space for my favourite - the ring of stones with one in the middle which means “Gone Home”. I may have it inscribed on my tombstone though it’s unlikely anybody will (i) remember and (ii) think it a good idea. You have never seen arrows the size of those with which I marked out the path to the Easter Treasure. They were simply huge, being left over from last year when I pruned the buddleia bush to drastic effect. I also had a few cardboard signs cut out from the box containing the Egg Hunt purchased from Tesco’s a week ago (I have no doubt other supermarkets are selling equally exciting Easter Egg Hunts - they wouldn’t want to miss out, now would they?!) The signs provided information such as “This Way”, “Getting Warmer” and “Over Here”. I calculated that Young Faris would enjoy displaying his reading skills to his sisters. I was correct in assuming the Rascals would suss out the Trail in no time at all. It was possibly a mistake to allow them to find and devour the chocolate eggs before we served up lunch in the back garden but, you know, Timing Isn’t Everything. Whatever the sensible people say. We scooted through Beach House Park; played in the newly reinstated East Beach sandpit - we didn’t find any hidden treasure, not actually being sure what we were digging for; made up tales with the help of brightly coloured story stones on sale in one of the beach hut art studios; and walked along Worthing Pier (Pier of the Year 2019) to buy ice creams at the best value refreshment kiosk in town. It was very, very hot but the Trio didn’t flag for an instant. Unlike others I could mention. Back home there was an Easter cake to decorate with mini eggs and jelly chicks (“Another sugar rush!” mourned the Trio’s Mum.) Plus I nearly forgot that other Easter Tradition, the classic Potato and Spoon Race. Which is like an egg and spoon race but, kind of, more robust. The Trio were already in their pyjamas but that simply added a certain edge to the occasion. “Remember I love you very, very much!” I told each of the Trio as I bade them farewell. It’s what I tell each and every one of my Tremendous Ten grandchildren, old and young, at the end of their precious visits. Young Morgan, Youngest of the (Not So Very Little) Welsh Boys, sweetly reprimanded me after a particular fun-filled and crazy visit: “ I always remember that!” Perhaps he reckons it goes without saying? I am wondering when an event, activity or happening can be considered a Family Tradition. I mean, how many iterations of the event, happening or activity are required before it receives Family Tradition Status? Is there a period of time over which it occurs before it becomes established? And am I - as the self-appointed determiner of our own Family Traditions - able to set the rules to suit myself? I ask because a new, and rather splendid, Family Tradition appears to be in the making, courtesy of the Darling Granddaughters. It is one I am keen to encourage being, as you all know, one who is Always Thinking About Her Stomach. It can be summed up as Cooking Dinner For the Grandparents ( The Grandparents in question, you understand, being Mr B and I) and was started by granddaughter Eleanor who, with her boyfriend Nathan, took over the kitchen on her last visit to serve up a really rather splendid noodle dish. It was noodelicious - which isn’t a real word, I agree with you, I just made it up but this is, after all, my Daily Blog so anything goes. No, I didn’t sent them to work in the kitchen straight away - I am not that shallow, you know. We had a lot to chat about and I was keen to ensure that The Boyfriend felt at home. Whether challenging poor Zac to a game of boules on the lawn was a good way of making him feel at home, I will leave you to decide but I thought it was a good idea. My granddaughter agreed with me though this was almost certainly because she emerged the winner from our Epic Battle of the Boules. The meal was totally delicious. Mr B was in good form. We warmed to The Boyfriend, not only because he had managed to lose at boules so gracefully, but especially when he promised us to look after our Hazel when the two of them set off on their travels in a few weeks time. She may have the nickname of a humble bagel, but she is very, very precious to us. Hazel’s mother, Youngest of the Darling Daughters, tells me that The Boyfriend reckoned talking to me was like talking to an older version of her. As in, we say exactly the same things, tell the same stories, you know the kind of thing. In the absence of any incontrovertible evidence to the contrary, my darling daughter and I have decided to take this as a compliment. You know it makes sense. You can probably understand why I think it would be a simply splendid idea if Cooking For The Grandparents became another day of our many and multifarious Family Traditions. It incorporates all the elements of the very best of traditions, in my humble (if biased) opinion, being all about Food and Family and - that most vital of ingredients - Love. My Little Sister and I are poring over a photograph of a family wedding to see if we can recognise anybody. Which is more difficult than you might be thinking as the wedding in question too’ place on September 24th 1916. Otherwise known as A Long Time Ago. We had left it rather late to start a new round of family history research as my sister and her fella really wanted to leave for home by around six o’clock. I am somewhat ashamed to admit that this meant that my brother in law was out in the kitchen, slaving over a hot stir fry, while his other half and I were enjoying ourselves trying to work out which of the several women, all dressed up in their wedding finery, might be our grandmother and whether any of the children might just be our four year old mother. Of the thirty people, young and old, captured in this Moment of Time, we only knew the identity of nine for sure - and that was thanks to second cousin Colin, whose father was an angelic curly-headed mite sitting with his brothers in the front row. We also knew who was the bride and who the groom though the fact that they were sitting in the centre of the front row and that she was wearing a bridal veil helped in our process of logical identification. We could usefully have started earlier and spent the whole afternoon in research but I wanted to take our visitors on a tour of an area of our home town they had not seen. 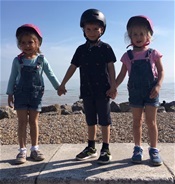 Especially I wanted to take them onto Worthing Pier (which has just been voted Pier of the Year 2019 - I am SO proud!) to show them all the stained glass Windows on the Pier, including one of the latest, celebrating the 25 years Voluntary Action Worthing worked to enable and encourage the local voluntary sector to thrive. While Bas, my brother in law, and I walked and talked, stopping every so often to gaze upon a particular window, my sister took her time, reading the inscriptions on every single window. I should have known she would - she was just the same when we were littl’uns. There was plenty of time, however, to point out the previously dull black bus shelters now painted in fetching pastel colours; the sea-front flower beds tended by many a local club, business or individual; the beach huts now used to display arts and crafts; and the spot on the beach where the East Beach sandpit will soon be installed for another summer. Well done to the Worthing Journal, the Worthing Town Centre initiative and all the members of the local community who love our town and do their bit to make a difference. A quick turn of direction took us into Beach House Park to see the memorial to the soldiers who lost their lives in the Battle of Boar’s Head on June 30th 1916 - known as “The Day Sussex Died” as local casualties were so high - and to peep through the railings at the Memorial to the Warrior Birds, the pigeons who carried messages to and from the Front during the Second World War. I always love the fact that so many pigeons frequent this area of the park today, for all the world as if they are paying their respects to their forebears. We finished off with coffee and cake in Palm Court Pavilion where a party of cheerfully chatty women were celebrating a Baby Shower for one of their number with a delicious-looking Afternoon Tea - before we headed back to the bus stop via the town centre. It was a Perfect Outing. You can understand, I’m sure, that as a result we don’t really have the time we need to pay due attention to William and Emma’s marriage in 1916. We will, however, keep at it - if nothing else it will give us another reason to keep in regular contact. We have so many questions. Which moustachioed gentleman is Thomas Charles? Which of the women in their wedding finery is Rosina? Who are the two elderly women, dressed all in black but with white feathers in their bonnets and wide smiles on their faces belying their sombre attire? Could one of them be the fabled “Aunt Tilly” of whom our dear Mum often spoke? I really, really need to know!